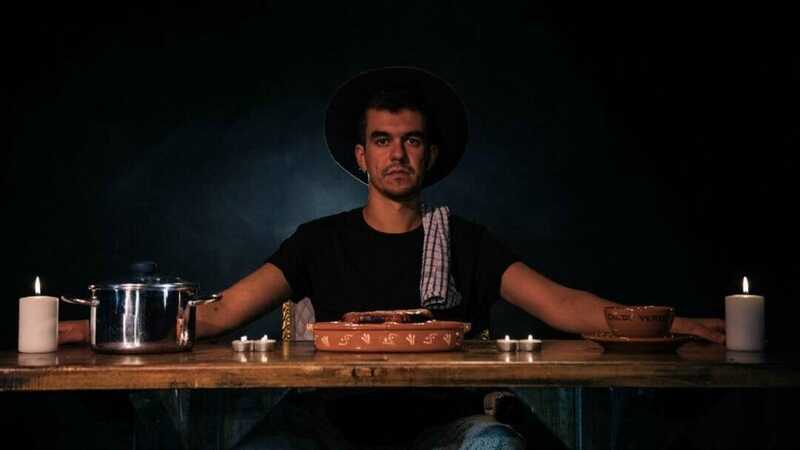 Following a series of well-received performances around the UK and Europe, POST – a solo theatre show with a difference from Xavier de Sousa, returns for a 5 day London run this spring at Battersea Arts Centre, followed by the Lighthouse in Poole. What makes POST distinctive as a solo piece is that Xavier invites his audience to join him at his kitchen table. Served with traditional Portuguese food and potent Cachaça, one can potentially get merry, make new friends and challenge and examine what exactly makes a ‘nation’. The food is prepared by Xavier de Sousa every night and is a traditional rural Portugal recipe called Caldo Verde (Green Broth, or Kale Soup), a warm, tender and inviting soup with deep roots in one of the poorest areas of the country: Minho. Made with kale and potatoes originally from the North West regions of the country, the soup and recipe has spread across Portugal over the past 600 years, as young migrants descended upon the country to find new jobs and ways of living. Today you can all it Portugal’s ‘national dish’. Also on the menu is Cachaça, a potent but sweet Brazilian spirit which is perfect to whet your appetite in time for the soup. The origins of the drink date back to the 1500s, during Portugal’s colonisation of Brazil, and is today the most popular national drink. Exploring ‘national identity’ as both a theme and theatrical devise, the mixing of cultures, experiences and outlooks are key. Xavier plays host, genially bringing these subjects quite literally, to the table while encouraging his audience to enjoy the delicious Portuguese fare on offer. POST considers what it is to exist in a country today and how we relate to each other reflecting upon experiences of people from different backgrounds who have made the UK their home. Xavier came to London 11 years ago and grew up listening to British bands. He says of POST: “It was essentially my way of re-gaining some sense, some pride and joy in the world and lived experience that being a migrant provides you with. So I looked at my own personal history and the history of the countries that I inhabit and how they are composed. I wanted to create a show that utilises the act of ‘hosting’ and ‘welcoming’ as a performance method but also the collective representation of voices that provide distinct ways at looking at a nation”. POST looks back through history and at specific traditions and identities that are part of both Portugal and England’s identity, deconstructs them and asks pertinent questions. Part of Occupy Festival, it is at Battersea Arts Centre 18th – 22nd March 2019 and Poole Lighthouse 27th April 2019.